I love this! I will remember the word. It’s a mighty fine word! The consent of Mizpah became popular during Bictorian times, in the UK. It’s popular re-emerged during WW1, as so many men were sent out to potentially die. My fist book is called Mizpah Cousins. A true story based during the Great War era. 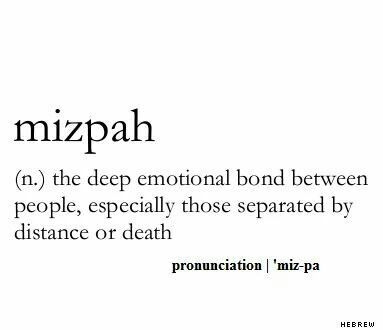 I love the word Mizpah, it has great meaning in my family. Being Anglo /German, both wars created a terrible agnst. Thanks for sharing your love of Mizpah! I’ll look into your book. Most of the people I love most live far away from me, so it’s an important word in my world. Bless you. Sending you Mizpah. And whoops that should have read Victorian. Typing on my mobile is not a good idea! Thank you for your interest. Love your post.